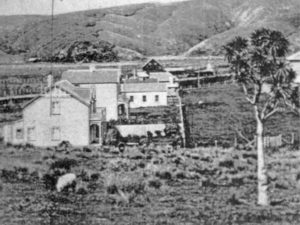 Plimmerton’s state school was established in 1904 when farmer, James Walker, donated a shed near the stream east of the railway station. 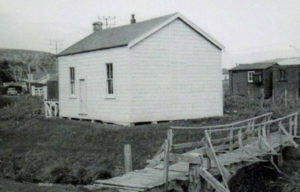 It opened with Miss EM Algie as teacher, and 17 pupils coming from as far as Pukerua Bay and Paremata. Before 1904 there were a few schools in the area. Bishop Hadfield noted in his memoirs that a Māori boys’ school was running at Hongoeka in 1825. When the Paremata barracks were built in 1846 on what is now Ngāti Toa Domain, a school was provided for children of regiment stationed there. The 1855 earthquake brought down the barracks and resulted in the closure of the school. is the iron shed used by Mrs Hanna for her school. Mattea and Antonia are on the right. When Mrs Laura Hanna arrived in the area in 1898 with her insurance agent husband and family, she was concerned about the lack of education for Plimmerton children. That year she gained permission from the Education Board to start Plimmerton’s first ‘state aided’ school in a cottage on her Steyne Avenue property, Erenora, where the Mana Flats now stand. The cottage was destroyed by fire shortly afterwards and the school moved to an iron shed next door, about on the site of what is now the St Andrews Church hall. 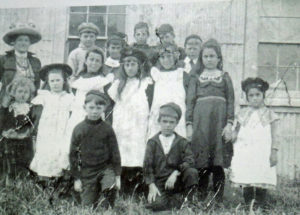 The school ran until the Hanna family left the district in 1904. First public school building donated by James Walker. Following pressure from the community, the Education Board agreed to provide a teacher and a publicly funded school if a suitable building was available. A local farmer, James Walker, donated a shed near the stream east of the railway station (likely to have been situated in the current Mainline Steam marshalling yard). In September 1904, Miss Emily M Algie, started as teacher with 17 pupils. By the end of the year numbers had increased to 22. A school committee was established with James Walker as chair. As well as local children, others came from Paremata and Pukerua Bay. The trip to and from school each day had its challenges. Trains were infrequent and not necessarily run to suit school children. Only a railway bridge crossed the mouth of Pauatahanui Inlet so the Paremata children walked across the sleepers. This could be very frightening for the children as there were no hand rails and nothing but the sleepers between them and the water below. In 1911 the local MP tried without success to get the Railways Department to build a foot bridge. Despite ongoing community pressure there was no foot access until the road bridge was finally opened in 1936. Generally the Pukerua Bay children had a better service once there was demand for a ‘commuter’ train from Paekakariki to Wellington. Before this the children walked down the road as far as Taupō Wetland then along the railway line to the school. This was much more direct than following Airlie Road, the only access to Plimmerton from the north until 1938. The school had some highly qualified teachers. When Miss Algie left, Mr Edward Mously took up the appointment for a year. He later became a professor at Cambridge University in England. The third teacher, Miss Annie Tasker left in 1910 to study law. She is said to have become the first married woman barrister in New Zealand.